To seal your tiles you need to determine the correct sealants to use for your chosen finish and the correct sealants to use for your chosen terracotta range, please contact us for more information. 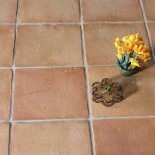 This can be determined by whether the tiles are to be laid indoors or outside, if laying outside you have fewer choices of finish as waxes are not suitable for exterior use likewise Boiled linseed oil which is a traditional finish for terracotta is not suitable for outside applications either. Note: Before you seal your terracotta you will need to clean down the tiles, ensure they are free from dirt and dust, on our handmade ranges you may have to wash down with a stain and residue remover, rinse well and allow to dry thoroughly before sealing. After washing the tiles they can be stood up on their sides to air and dry completely. Failure to dry or clean will result in moisture or dirt being sealed into the terracotta and this will effect the final appearance and performance of the oils and sealants. To darken slightly a Stone oil can be used as a pre-seal but must be finished with a final sealant to protect the tiles against spills etc. for this we have a product called Mattstone that will completely protect the terracotta and leave a matt finish. To darken more deeply an Antique stone oil can be used and finished with Mattstone as detailed above. To keep the terracotta in its original colour shade apply 2-3 coats of Mattstone for a great protective and matt finish. Mattstone that will completely protect the terracotta and leave a matt finish. Ironwax Satin or Gloss that will completely protect the terracotta and leave the desired finish. All the information above applies to our Handmade and machine made ranges, our Stoneware range needs just a final seal with Mattstone after laying covering grout lines as well to fully protect against oil spills, contaminants and scuffing etc. This entry was posted on June 4, 2013 by Living Terracotta in Terracotta sealing tips and tagged How To Seal Terracotta, Sealing Terracotta.